Free Genealogy Tools: Are You Royalty? Could I be the Duke of Downtown? The Earl of East Flatbush? The Blue-Blooded Baron of Brooklyn? Maybe even the Prince of Park Slope? A labor of love (or eccentricity, as the site's author puts it), thePeerage is put together by a nice looking fellow named Darryl, who has amassed a whole lot of information on British peerage, European nobility, Lords and Ladies of the Manor, and royalty in general. The Surname Index includes more than 40,000 surnames of more or less royal families, and hundreds of thousands of individuals, with lineages going back many generations, and many hundreds of years. There are wonderful names and titles here, like the Rt. Hon. Sir Spencer Cecil Brabazon Ponsonby-Fane. Many names even come with a Consanguinity Index, which I suppose indicates just how noble they really are. 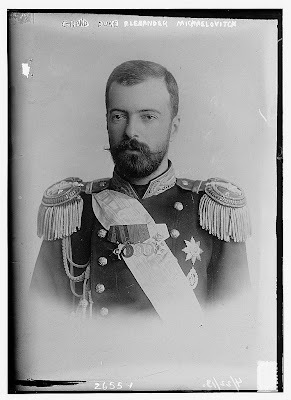 Grand Duke Alexander Michaelovitch. A distant relative, perhaps? So, if you've ever wondered how closely connected you may be to the 11th Viscount of Crowhurst, this is the site for you.